I can see why this would be your favorite. Love the angle you took this one from. 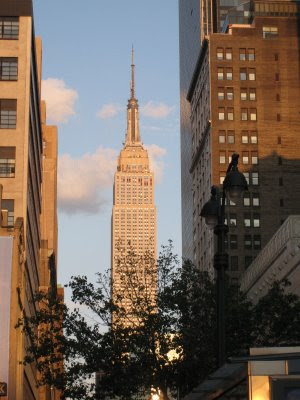 Wow, this is a perfect shot of the Empire State Building, well done! I just love this shot, New York is my second favourited city. Such an iconic building swathed under a gorgeous blue sky. Lovely warm sun and fluffy clouds. I took a lot of the building from a fifth floor apartment in Brooklyn at night.. they sometimes change the colors of the lights... But, the hole, the space in the skyline where the towers once stood.. is still such a stark reminder.